was inspired by people, research, stories, art forms, and many, many other elements. Explore Evan Turk’s inspiration and resources for teaching below. Look for ACTIVITY listings for individual thematic projects to do with readers of all ages or download a complete, consolidated list of Activities for Educators, Librarians, Families, Readers. 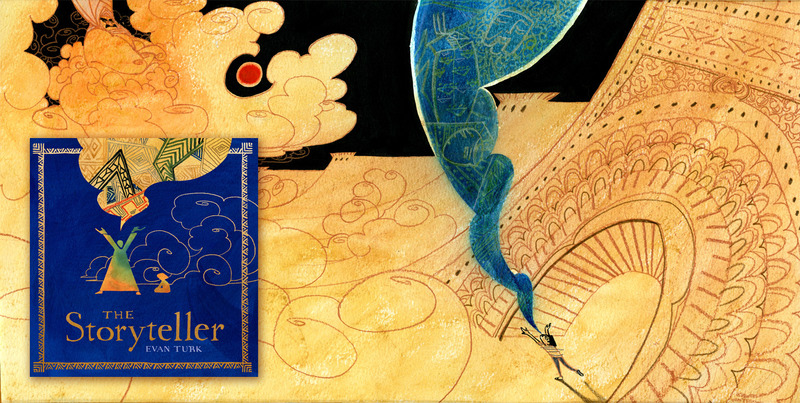 If you are holding an event for The Storyteller, feel free to use this image for your outreach. Our thanks to former Moroccan educator Abdelaziz Rhazzali for explaining the Moroccan Arabic words in the picture book and the companion teaching materials. The elements of weaving in the story were inspired by Association Tifawin: Weavers of Anzal, a traditional wearing collective in Morocco. Want to explore more? ACTIVITY: WEAVING ACTIVITY & DISCUSSION QUESTIONS In traditional Moroccan culture, women weavers told their stories in the patterns of their carpets. Use the creation of cardboard looms to explore color choice, color theory, Moroccan carpets, and the colors and patterns of this book with readers. Morocco’s public storytellers, or hlaykia, have been learning, preserving, and sharing stories for more than 1000 years. Want to explore more? Recently there has been a resurgence in storytelling in the city of Marrakech, where young Moroccans learn from master storyteller and take ownership of their culture. Want to explore more? ACTIVITY: EXPLORE STORYTELLERS & DISCUSS THE ROLE OF STORYTELLING This activity includes an essay about a famous Moroccan storyteller and a letter to your readers from an up-and-coming young storyteller. Discussion questions and suggested activities ask readers about the role of storytelling in their lives and how technology may have changed our listening and storytelling. ACTIVITY: INTERVIEW THE ELDER “STORYTELLERS” IN YOUR COMMUNITY In Morocco, storytelling is an art form that has passed from generation to generation for over 1000 years. Do our elders have stories to tell us? Using themes from the book, this activity encourages readers to interview elders. An introduction letter and final poster template are included. While water is a struggle throughout the Sahara, water is used in the book as a metaphor. Dwindling water supplies signify the cultural lose of storytellers and our growing thirst for stories. In The Storyteller, words and stories are as essential to life as water. Words fill cups, fountains, but also our cultural sense of self. Want to explore more? ACTIVITY: ORIGAMI TO CONNECT STORIES & THIRST Readers are invited to write and draw in the “pool of blue” on this activity sheet as the book is read to them. When they fold the paper according to the origami instructions, readers will hold a cup filled with water, words, and images. This reinforces the book’s theme that you can quench your thirst with story! With the Sahara Desert covering 3.5 million square miles, it is no wonder that the word for “desert” in Arabic is “Sahara.” For many of us, the word “desert” signifies an absence of water. The Sahara, in fact, has rivers, lakes, and substantial underground reservoirs or aquifers. The distribution of water and access to water, though, is an age-old struggle that increases as the climate warms. Also on the increase is innovation. How are innovations attracting and managing water? How is our knowledge of the Sahara growing? 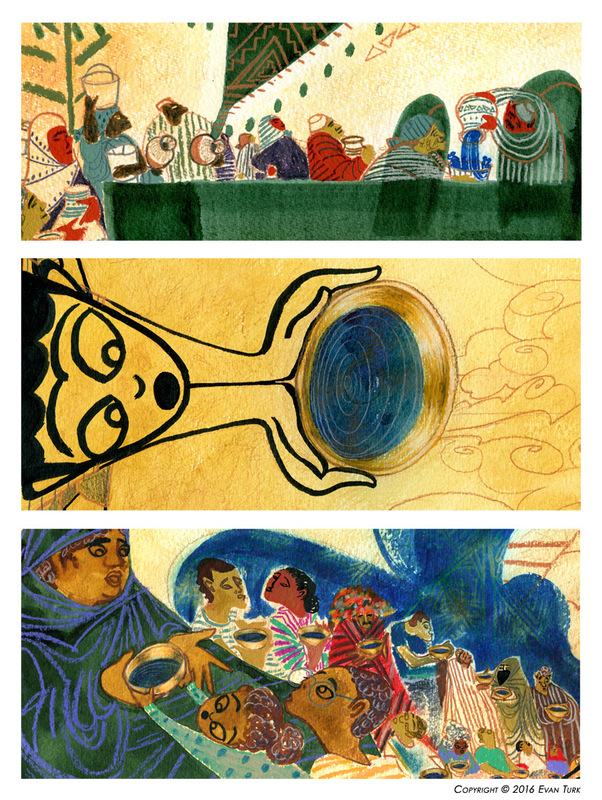 Evan Turk’s illustrations for this book were influenced by Arabic calligraphy, Moroccan carpets and the art of Gustav Klimt. 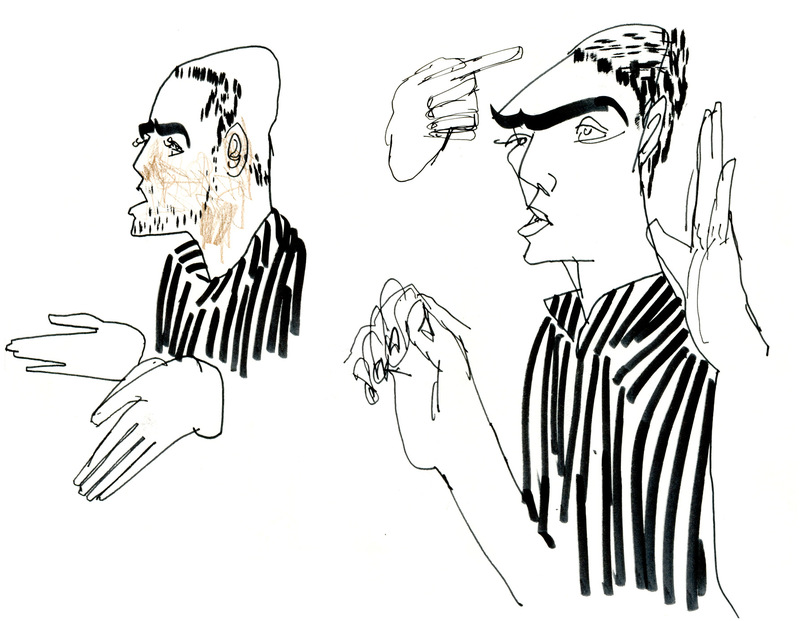 READ about Evan Turk’s art influences. 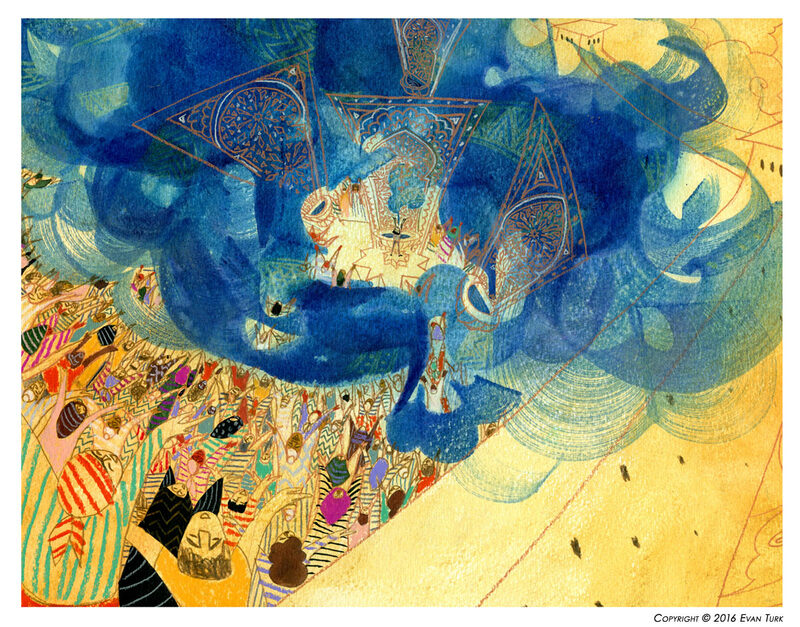 READ an article in Muslim Kids’ Journal about Arabic Calligraphy, a major influence on the artwork of The Storyteller. ACTIVITY: EXPLORE VISUAL LITERACY Like the creator of a Moroccan carpet, Evan Turk has woven meaning into the colors, patterns, and placement of the images in The Storyteller. 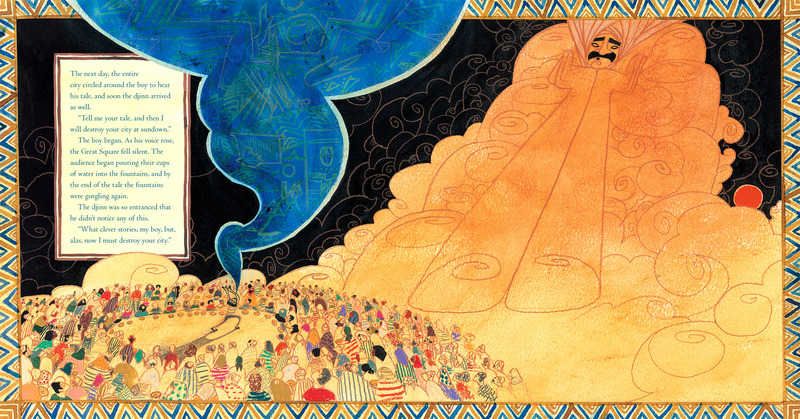 Explore the book’s many visual literacy opportunities with art discussion questions. ACTIVITY: CREATE ART WITH INDIGO, TEA AND FIRE The artwork in The Storyteller was created using a long list of materials including water-soluble crayons, colored drawing pencils, and inks. But Evan’s favorite technique in the book involves indigo, tea, and fire! Learn more about this technique (which should not be attempted without adult supervision!) in the linked video. This collection of largely Middle Eastern and Indian stories of uncertain date and authorship includes the well-known of folk tales Aladdin and his Wonderful Lamp, The Voyages of Sinbad, and Ali-Baba and the Forty Thieves. The stories have fascinated readers of many cultures for centuries. 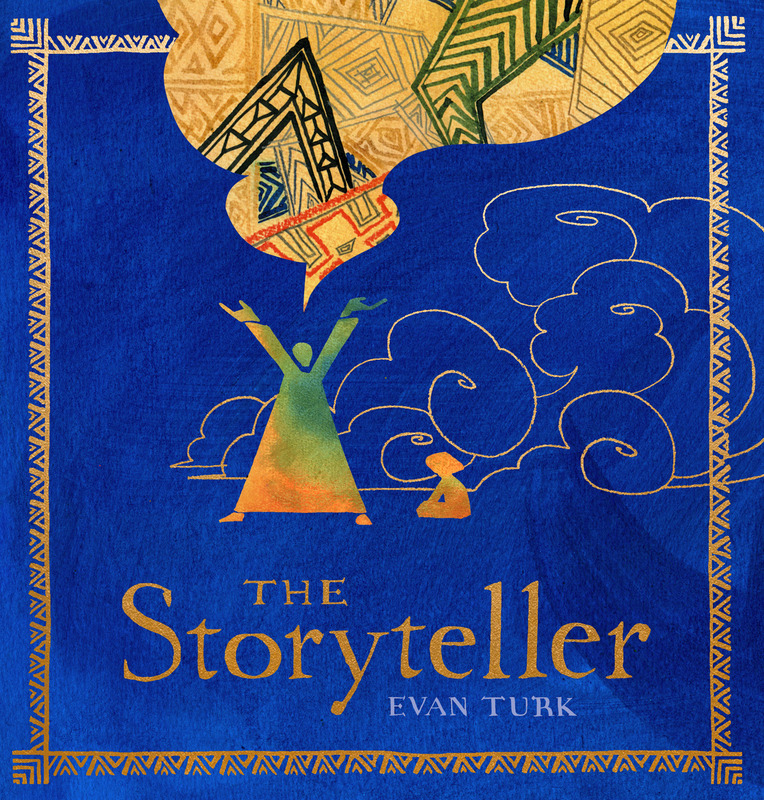 Evan Turk’s The Storyteller is inspired by Shahrazad, The Arabian Nights‘ own storyteller. Shahrazad delayed her execution at the hands of her evil husband by enthralling him each night for 1001 nights with stories. Want to explore more?